Display and quickly update school bus scheduling, driver/fleet assignments, maintenance updates, route, trip and transportation department activities, etc. 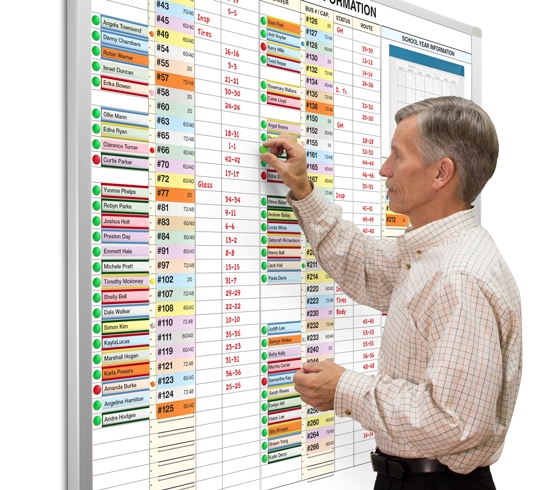 From school transportation departments requests ove the years, we've developed these color-coded magnetic board kits for displaying, changing and visually communicating bus scheduling, driver/fleet assignments, maintenance updates, route, trip and transportation department activities, etc. They're ideal for posing and viewing the overall picture with enough space available for notes and pertinent details. If you would like one of our specialists help you find the board you have in mind or help you design one, please call 800 624 4154. No obligation. We can build and ship it to you in 3 business days or less.